Int. Forum des Jungen Films - Berlin, Germany / Mostra Int. d'Arte Cinematografica - Venezia, Italy / Karlovy Vary Int. Filmfestival, Czech Republic / Int. Filmfestival Rotterdam, The Netherlands / São Paulo Int. Filmfestival, Brazil / Buenos Aires Int. Filmfestival, Argentina / DocLisboa Filmfestival, Portugal / Denver Int. Film Festival, U.S.A. / Bradford Int. Filmfestival, Great Britain / Diagonale - Festival of Austrian Films, Graz, Austria / Documenta-Madrid, Spain / Era New Horizons Int. Filmfestival - Wroclaw, Poland / Split Int. Festival of New Film, Croatia / Duisburger Filmwoche, Germany / Saratov Sufferings Int. Filmfestival, Russia / DocPoint Helsinki Int. Filmfestival, Finland / Full Length Festival Lublin, Poland / Austrian Cultural Forum - New York, U.S.A. / ZagrebDox Int. Documentary Film Festival, Croatia / Jeonju Int. Filmfestival, South Korea / European Film Week Tehran, Iran / Transilvania Int. Filmfestival, Romania / Cinédécouvertes Competition - Belgium / dfi-Symposium "Töne sehen - Bilder hören" - Köln, Germany / Italian American Institute - New York, U.S.A. / European Film Days - Tokyo, Japan / Lume Int. Filmfestival, Brazil / Int. Film Festival "A Mans' Shadow"- New Caledonia / Bildrausch Filmfestival Basel, Switzerland / Isola Cinema Int. Filmfestival, Slovenia / Festival du Nouveau Cinema - Montreal, Canada / Copenhagen Architecture x Film Festival, Denmark / Shadow Filmfestival Amsterdam, The Netherlands / Würzburger Filmwochenende, Germany / Int. Filmfestival Innsbruck, Austria / Filmschau Visionary - sixpackfilm, Austria / Walserherbst, Austria / Lessinia Filmfestival, Italy / Der Neue Heimatfilm - Freistadt, Austria / Riga Int. Filmfestival, Latvia / Trento Int. Filmfestival, Italy / Int. Filmfestival Human District, Belgrade, Serbia / Mirabile Dictu - International Catholic Filmfestival, Vatican City, Rome, Italy / Philosophical Film Festival, Skopje, Macedonia / Indie International Film Festival Belo Horizonte, Brazil / Cinemigrante International Filmfestival - Buenos Aires, Argentina / Sose International Filmfestival - Yerewan, Armenia / International Filmfestival Carthago, Tunis, Tunisia / Festival Internacional de Cine por los Derechos Humanos, Bogota, Columbia / Cinemigrante International Filmfestival, Barcelona, Spain / El Ojo Cojo International Film Festival, Madrid, Spain / Saratov Sufferings Int. Filmfestival, Russian Federation / Eindhoven International Film Festival, The Netherlands / This Human World International Film Festival, Vienna, Austria / Scandinavian International Filmfestival, Helsinki, Finland / A Film for Peace Int. Filmfestival, Udine, Italy / Wolves Independent International Film Awards, Vilnius, Lithuania / Festival Internacional de Cine de Autor, Guadalajara, Mexico / Cinemigrante in Canterbury, Great Britain / Llega de CineMigrante a Venezia, Italy / Sede Asociacion Audiovisual Ayahue , Pichiquillaipe, Spain / Mediterranean Experience - Reggio-Calabria, Italy / San Mauro Torinese Int. Film Festival, Italy / Viennale - Vienna International Filmfestival, Austria a. o. “Making films,” says Peter Schreiner, “is a means of talking. Maybe even a substitute for talking. I’ve always had—and still do—a problem with the imprecision of language.” It is the summer of 2009, and we are sitting in the garden of his family’s inherited house in Grinzing, Vienna’s nice, green suburb famous for its Heurige, Austria’s popular wine taverns. Amongst other things, I’m here to find out why this singular director had stopped talking for so long, at least through films. Before his comeback with his first video work Bellavista (2006), which won the main documentary prize at Austria’s national film festival, the Diagonale, in 2007 and went on to garner some interest on the festival circuit, there was a decade-long gap in his filmography. I’d been curious about this mystery man of Austrian cinema for years, having encountered his name sporadically, but enthusiastically, dropped in conversations, while his films and writing on them had remained frustratingly elusive. His best-known credits were as a DP on two pictures by other directors, whose places at opposite ends of the historical spectrum added another layer of mystery. The first was Niki List’s Malaria (1982), a key film about Vienna’s New Wave-era scene (and, by way of relative popularity, of an emerging younger generation of filmmakers). List was then a close friend and collaborator, whose career was defined by the subsequent one-hit wonder Müllers Büro (1986), a silly genre mix that remains one of the country’s biggest commercial hits. On the other hand there’s Feldberg (1990) by fellow Austrian sensibilist Michael Pilz, an amazing meditation on a man, a woman, and a landscape, whose troubled production history and reception sealed Pilz’s disenchantment with Austria’s national film funding, and led him to abandon celluloid for autonomous videomaking. Still, despite certain parallels, Schreiner’s aesthetic and methods differ considerably from Pilz’s, and while his prolific peer has remained an imposing presence on the margins, Schreiner for the most part has remained marginalized to the point of near invisibility. Which made the stunning maturity on display in Bellavista even more of a shock. Schreiner’s seventh feature—categorizations of documentary, fiction, or experimental fall woefully short—possesses a formal clarity, while dazzling with a mixture of hard-won worldly wisdom and stillyouthful passion of expression. At first glance, Bellavista seems a documentary portrait of a town in Northern Italy, one of the last places where an old Tyrolean dialect is still spoken, focusing on the family operating the titular hotel—especially Giuliana, the youngest daughter, whose troubled memories account for her difficult relationship to the place and its culture. But quickly one realizes that Schreiner is after something different, more complex and elusive. His meticulous, yet often oddly framed black-and-white images hardly evoke the “beautiful view” evoked by the title, although the multifaceted textures of the shades of grey carry their own poetic charge, as do the unusual compositions, with their insistence on details and fragmentary glimpses, body parts protruding offscreen, or people placed mostly at the very edge of frame. Much remains unsaid in the conversations and reminiscences, asking the viewer for alert attention, which is rewarded not with the revelation of coherent biographies and stories, but with a deeper understanding of the situation (and, amongst other things, the way some things must remain unsaid). Schreiner’s frugal frames and sensuous sounds invite careful watching and listening, creating complex results—which mirror the ambivalent nature of Giuliana, caught between her roots and rebelling against those very traditions. From that perspective, Bellavista also emerges as a near-surreal, philosophical antidote to the idyllic images of the traditional Heimatfilm. Clearly, this was the work of a major filmmaker, as proven by his next work, the video-portrait Totó (2009) in Venice’s Orrizonti section. Its title comes from the nickname of Antonio Cotroneo, born in the Calabrian coastal town of Tropea, who has been living in Vienna for a long time. Schreiner accompanies him on various visits home, intercutting the tours through the small settlement of medieval houses and rocky seaside territory with the marbled halls and corridors of the Wiener Konzerthaus, where Totó works as an usher. Schreiner treats this bulwark of civilization as a mindscape no less alienating than the most inhospitable nature: a labyrinth of mirror images, with oblique angles contributing to the disorientation. The protagonist emerges as a divided person—shortly after the beginning, in a trademark Schreiner train shot, the camera pointing forward at the tracks, he reminisces about his emigration: “Up to the curve, I always imagined I Totó. Having passed the curve I have not been Totó any longer.” As his encounters in Tropea reveal, he has become a stranger, his ruminations expressing the disappointment about the impossibility of re-entering the world he inhabited as a young rebel. “I imagine what it’s like to be dead,” Totó muses, while Schreiner provides a breathtaking bird’s eye view of the beach. “He is a prisoner,” the filmmaker tells me, “but there is also another perspective.” The major driving force behind Schreiner’s work is a longing for freedom. The rekindled interest in Schreiner from Totó helped to prompt a first, if not quite complete, retrospective at this year’s Diagonale, an occasion which will also mark the overdue first career considerations on Schreiner in German. This is a welcome change of pace for Schreiner, who was a bit nervous about Totó’s premiere, even as his enthusiasm about the positive response to Bellavista was still palpable. After all, it had been mostly an uphill battle: Of his previous 16mm films (none have English titles of which I’m aware, so I’m giving literal translations)— Grelles Licht (Glaring Light, 1982), Erste Liebe (First Love, 1984), the short Adagio (1984), Kinderfilm (Children Film, 1985), Auf dem Weg (On the Way, 1990), I cimbri (The Cimbrians, 1991) and Blaue Ferne (Blue Distance, 1995)—only the second, Erste Liebe, had short-lived Austrian distribution. After I cimbri finally met considerable appreciation on the festival circuit, the lack of interest in Blaue Ferne proved devastating; Schreiner recalled a screening in Rotterdam of this “cursed project,” whose soundtrack had to be painstakingly “reconstructed” because of a technical malfunction. Arriving near the end for a Q&A, he found the film playing to an empty theatre. Since for Schreiner film is a means of communication and exploration, of getting in touch with other people and the world, this setback played a major role in his break from filmmaking. Health reasons also contributed: He had ruined his eyesight while editing. Selling or giving away his carefully assembled cameras and editing tables, he embarked on a pastoral education, even applied for a post as a deacon, but was ousted by intrigues from the fundamentalist quarter, then worked for several years with children and adolescents. But although direct contact with others proved fulfilling, a longing for that other way of touching, though cinema, remained. And once having encountered Schreiner, it is hard to see his movies as separate from the man: extremely modest, deeply committed and serious, but certainly not humourless and with an openness, patience, and undidactic exactitude. Over the course of hours he remembers, explicates, and explores, often returning to a previous point to elaborate, refine and softly, but diligently, correct earlier statements. At some point I stop changing the cassettes in my tape recorder: It’s an encompassing immersive experience very much resembling a Schreiner film. And even as film culture seems to have branched out in areas that allow for a certain compatibility with his vision, that experience remains utterly unique. A young couple kissing joyfully at the breakfast table, playful, excited, re-embracing, postponing the goodbye for nearly two minutes, before she leaves and he pensively lights a cigarette as the title is superimposed on a blindingly white screen surrounded by a dark circle, suggesting the spot of a projection lamp: The astonishing first shot of Schreiner’s debut Grelles Licht is an emblematic moment. Immediately, there’s an abundance of this special feeling of natural spontaneity, yet also the insistence that things take time. “You can’t chase after things,” Schreiner declares categorically, “you have to let them become. You have to be long enough in a place for something lasting to emerge, even with the most banal things. It takes time. And it will be beautiful, if you take the time.” Part of the disarming beauty of this first shot is that it both evokes vital ecstasy and hope, some unconscious, irretrievable happiness—in this case, of young love—but it applies to Schreiner’s notion of living in general. Yet for all the time it takes, this potentially endless state of bliss eventually is over, making one painfully aware of the finiteness of things, felt in disappointments and alienation, something that is especially pronounced in the last two films with their protagonists who have come to realize, mostly, where they don’t belong. In those films, Schreiner is offscreen, although his presence is still keenly felt (only in the final cut of Totó did Schreiner remove himself from the last two scenes). Erste Liebe is, together with Adagio and Blaue Ferne, one of the three Schreiner films I haven’t seen, but an enthusiastic contemporary notice by Bodo Hell suggests a continuation, noting that “Erste Liebe does not leave the spectator alone, the way the camera won’t leave the people standing and acting in front of it alone.” In any case, Kinderfilm picks up on the structure and themes of Grelles Licht. Near the beginning of the collage Schreiner and his future wife Maria are sitting in an Italian landscape, and she’s translating from the Divine Comedy (he’s learning the language; Italy will subsequently evolve in to being a second important focus of interest); this is another scene emblematic for the time it takes to give this labour of love adequate room and resonance. The corresponding refusal to break up and condense the moment is characteristic of Schreiner’s modest refusal of commercial conventions in the name of unmediated togetherness. It’s a natural step on the path he embarked on when, in 1981, he quit his job as a cameraman for Austrian state television ORF. (There he was known for being “rather slow, but with original ideas and a knack for getting close to people.”) What one wants, however, is a key issue of Schreiner’s human poetry. Kinderfilm mostly moves back and forth between two groups: Children of friends, for whom the Schreiners hosted a weekly afternoon, and his graduation classmates at their tenyear reunion. Over schnitzel and beer, these average men without qualities smugly remark on their wisdom, successes, and career developments, content with being cogs in the machine and without any individual dreams left. An incredulous Schreiner looks on speechlessly, while in between, in one of his jaw-dropping interludes, there’s a mesmerizing shot of a low-flying plane crossing the heavily overcast sky. These confrontations with a lifeless status quo illuminate Schreiner’s understanding of alienation and his fascination for outsiders, while the marvelous children scenes serve as counterpoint, bringing back a time of endless possibilities, a time when (as Schreiner’s father recalls) even the days seemed to be longer. With I cimbri, Schreiner recedes from the frame, and it’s his one film that could be comfortably classified as an ethnographic documentary (whereas Blaue Ferne, I’m told, hews closest to being a fiction feature): At the request of language researchers, Schreiner went to the small titular community, located in the Alps near Verona. The dialect used there, a mixture of Italian and German influences, goes back to the middle ages, but by the time Schreiner arrived, only a few of the town elders were still able to speak it. In Schreiner’s hands, the imminent end of their culture becomes another essay on time, finding the last pockets of its presence, the echoes of its dissolution and the traces left behind. Video technology, by now good enough to have “real blacks,” has proven not only an economical relief—Schreiner shot about 160 hours for Totó—but also made it simpler to organize and edit, helping to create more montage-based, modernist mosaics, whose arrangement Schreiner likens to “sculpting, with the carving away getting more difficult and painful with each subsequent edit: But you also feel a structure growing, the creation of something new, and that is one of the most beautiful experiences there is.” “I’ve become a lot less dogmatic when I reduce the material. 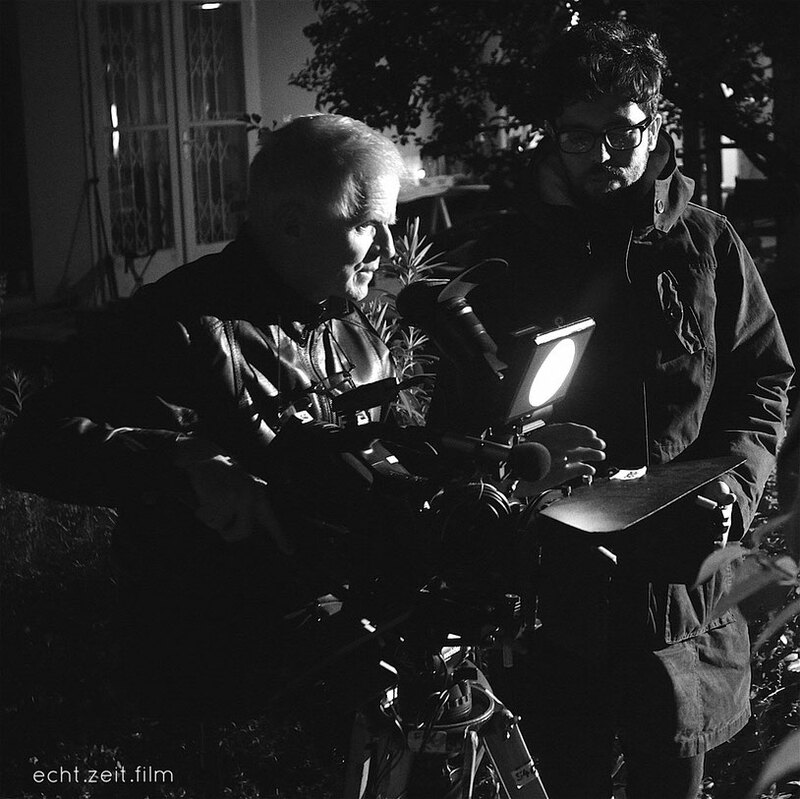 In Grelles Licht there are 100 shots at most, Totó has nearly 500,” Schreiner states casually, but there’s an even more noticeable change: “If Schreiner’s earlier cinema has the feeling of a journey, time stands still in the contemporary films,” Möller has noted. “They are attempts not just to look at time at work, but to give it an audiovisual form. You no longer enter them and find your place, you encounter them, opening up yourself.” Both Bellavista and Totó are characterized by throwing a series of striking close-ups into the Schreiner mix (bringing to mind that his favourite director has always been Bergman). Their repeated canted compositions and other decentralized images, combined with sharp jumps in the shots’ field size, make palpable the alienation of the protagonists, the conflicting emotions raging inside their tempestuous souls. But beyond those torrents is also hope: After the final stretch of Totó is literally shaken up by an immense storm, the moving final image shows a life-size boat model hovering high above town against a clear horizon. Sometimes the essence of things can be that simple. You just need to take the time. Peter Schreiner sheds light on FATA MORGANA. Three human figures appear in a desert, with sunlight piercing their surroundings. One member of the group, a man, is perhaps a guide for the other two, who form an aging couple. Peter Schreiner’s film Fata Morgana (2013) opens with these people, standing essentially still, having come to a new place (as the male member of the couple says) “to find a point of reference or of inner stability.” The film lingers on their faces as they think and talk about how to do so; images later appear of the couple’s members indoors in a farmhouse and outside staring at rocks and leaves, possibly around their home, potentially seeking that same point. The displaced people move between the film’s different locations—physically, psychically, and spiritually—in search of a peace that they might share. The journey forming Fata Morgana—which screens this week at the São Paulo International Film Festival—is photographed in strong black-and- white, bringing details of depth, texture, light, and shadow into sharp focus. So have nearly all of the Austrian artist Schreiner’s previous films, beginning with the aperture’s flooding open at the start of his debut film, Glaring Light (1982). 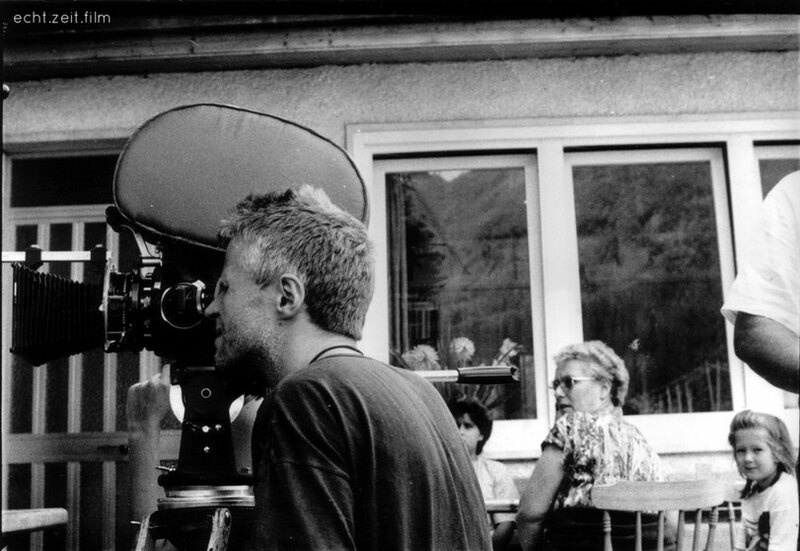 The film featured the then-twenty-five-year-old filmmaker himself, as well as a number of friends and loved ones, in a collection of scenes of young people exploring Austrian and German cities in search of themselves. At several points people talk or simply laugh in close communion with the camera, building up to images of Schreiner and a friend lying on the grass after driving from Vienna to Kassel. 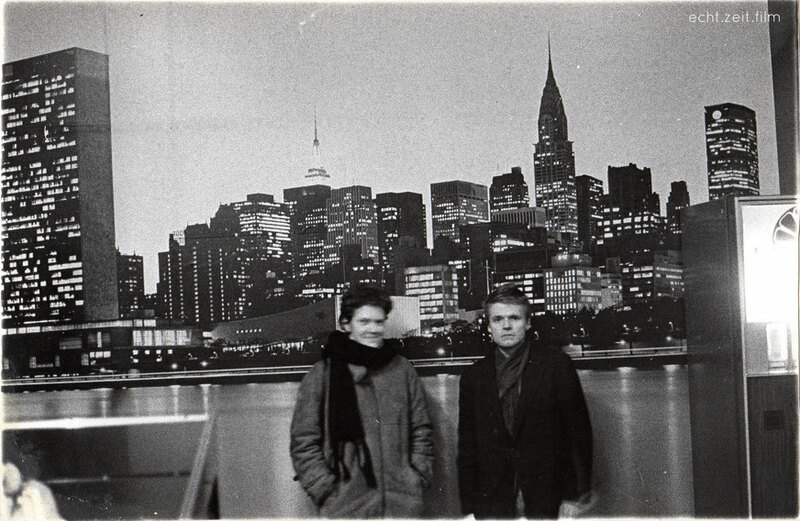 Glaring Light and Schreiner’s subsequent First Love (1983) were poetic registers of the everyday, observing people from a comfortable distance as they found pleasure through the act of discovering their surroundings. 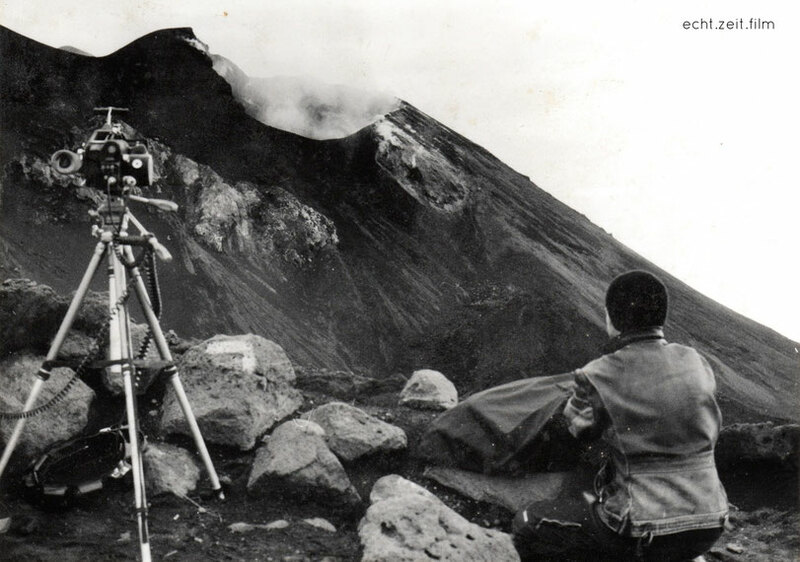 Over time, the filmmaker’s journeys expanded while his focus sharpened. The central point of view in the travelogue On the Way (1986-90) is its camera’s, which regards an Italian mountainside and a sleeping infant with equal freshness and equal wonder. Everything that the film sees is examined closely, such that otherwise quotidian sights—a small, sentient group of trees, or a supine pregnant stomach rising and falling—take on a natural splendor. Illumination has come throughout Schreiner’s cinema to apply even and especially to human faces, which Schreiner (acting as his own cinematographer and editor, even in past periods of poor eyesight) has increasingly explored as rich landscapes. Fata Morgana concludes a digital trilogy, begun after the longtime 16mm filmmaker took an eight-year hiatus from directing, in which Schreiner and another person or small group of people explore surroundings new to them. In Bellavista (2006) and Toto (2009), a woman and a man respectively return to the Italian villages of their births after long periods of separation from them, such that they find the old places to be deeply unfamiliar; in Fata Morgana, the people similarly seem to be discovering many of their surroundings for the very first time; and in all three films, the camera studies the lines and grooves in its human subjects’ faces, settling upon an enlarged eye or nose for a while as the person breathes silently and thinks. 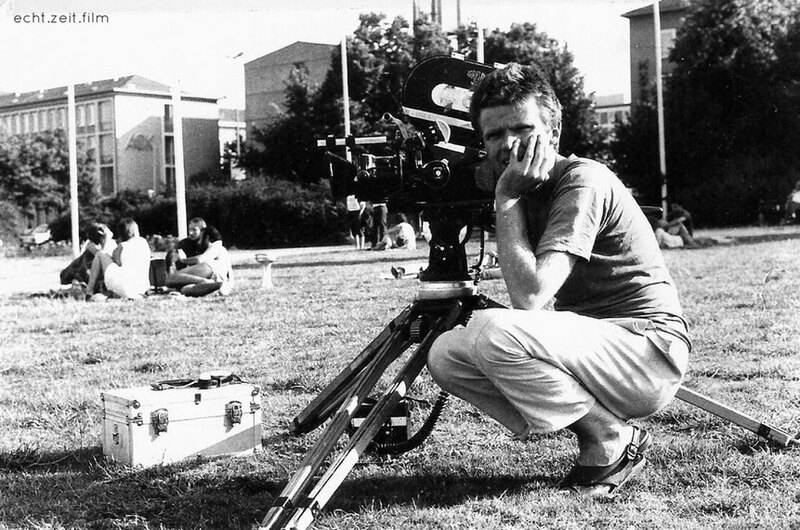 Schreiner’s films have much in common with those of his two key filmmaker references, Ingmar Bergman and Michelangelo Antonioni. Like them, he has moved over time from initial neorealism to eventual psychological realism, shifting deeper into focus on human bodies in search of guarded souls. Schreiner has done so in close collaboration with a consistent team of offscreen collaborators—including his wife Maria and two adult children—as well as a small number of regular actors, whose evolving presences from film to film create a narrative of people changing over time. 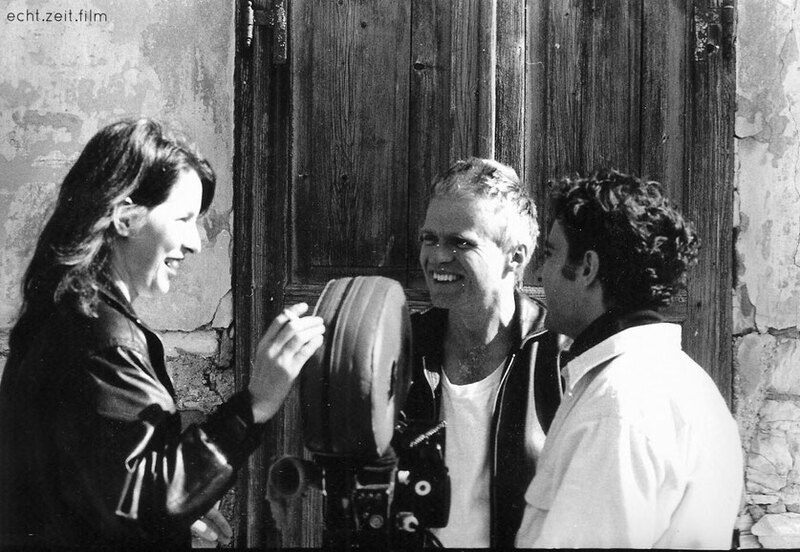 Though the Libyan guide in Fata Morgana, Awad Elkish, is new to Schreiner’s films, both members of the couple have previously appeared in them. The pockmarked man, Christian Schmidt, emerged nearly thirty years prior from among a group of young friends and their family members enjoying each other’s company in Children Film (1985); the richly wrinkled woman, Giuliana Pachner, searched with wide, uncertain eyes through the resort area of her provincial native town in Bellavista. Fata Morgana presents many isolated images of each lover as he or she considers new surroundings, as well as a few precious moments of the pair united, whether touching foreheads intensely or simply sitting by each other’s side. Throughout, one senses a patient offscreen observer keeping them and Awad close company. In the following monologue, created with Schreiner over e-mail, the filmmaker reflects on how Fata Morgana and other films present a lifelong journey taken in order to find oneself, undergone with fellow travelers. A collective trip (over and over again begun) of euphoria, refused in everyday life, moving from passive exhibition of the bare being to an active breakthrough of self-representation in front of and behind the camera. A movement (over and over again begun) of a flowing of these currents into each other and the impulse of transition between them. A projection from outside to inside to outside. The riddle of impenetrable surfaces. The riddle of (thereby released) thoughts, feelings, and spiritual movements. Learning and also forgetting things over the years. Such that the timeless things remain. frame for frame, always anew. As I have made films I have experienced, over and over, that projects grow by themselves out of life. Fata Morgana originated from chance. I never had the intention to travel through the desert, let alone to shoot a film there. I would not have been there at all were it not for the invitation of my Libyan friend Awad Elkish, a city-dweller in Tripoli, to introduce my family members and me to his desert, the place of his longing. Maybe also at the beginning there stood the travel story of Giuliana Pachner, who had once, several years ago, been sent on the run from the narrow-mindedness of her village to the Italian island of Lampedusa, on whose shores many refugees had already run aground. A certain feeling of groundlessness, in fact, inflicted all of us: my friend Hermann Krejcar’s sensations of homelessness, my friend Christian Schmidt’s feelings of having lost the impartiality and instinctiveness of his youth, and my own fears, my own isolation, my own crises. Crises make films. This is my age-old experience. All my films are marked by crises, born from crises, sometimes even released them. To me, it is clear: In order to film, one must dive into crisis, or better yet, to dive through it, and find a way to new shores. but rather ravenously in search of human contact, for someone into whose eyes I could finally look. Glaring Light became a sort of emergency program for me. I had to make it. Above all, I had to make it in such a way so that it would become what it wanted to be, without deducing or considering how it would work on other people. The film’s title itself indicates how the work was my act of self- authorization. For me cinema posed the only possibility through which I could express my oversized longing, and through which I could share all the lives that I saw and felt inside myself with others. 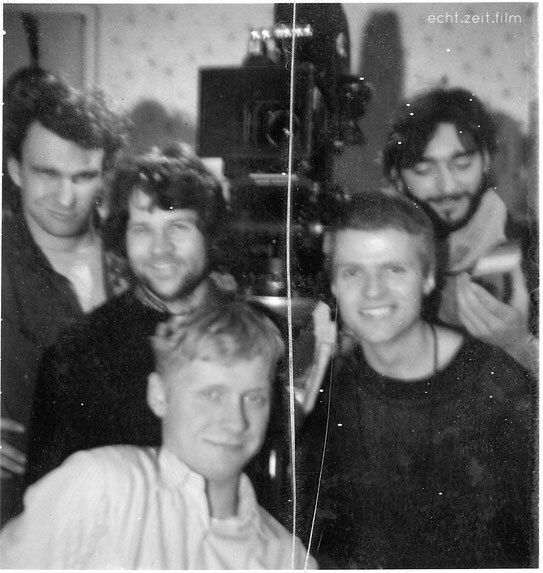 Hermann, who played the main character in Glaring Light, had lived with me for some time, and we agreed to shoot a part of the film together, with him in front of the camera and me behind it. Once we had finished preparing ourselves for the shoot, however, he told me that he absolutely had to travel at that instant to the German city of Kassel, about six hundred kilometers from Vienna, to visit the art fair documenta. My answer was that I would go with him. And so we did. I felt instinctively that the work could succeed only through a strong formal reduction and a clear line of action set within the most obvious locations, both physically and psychically. Yes, we drove hundreds of kilometers in my father’s car from Vienna to Kassel, but once we arrived, the film became more important to Hermann than the art exhibition was. It did not seem at all necessary to go inside the buildings, and instead we stayed outdoors on the meadow. If I look for the differences between how I did it then and how I might do it now, I will see none. Abstraction, not naturalism, is the strength of my films. I had to escape from technical accessories at the outset. I had to leave my place behind the camera and literally enter the scene in order to be able to enter my first true work, the first to become a part of me and in which I felt fine. I used black-and-white then, as I have for all my subsequent projects, which has helped me to reduce and find abstraction. 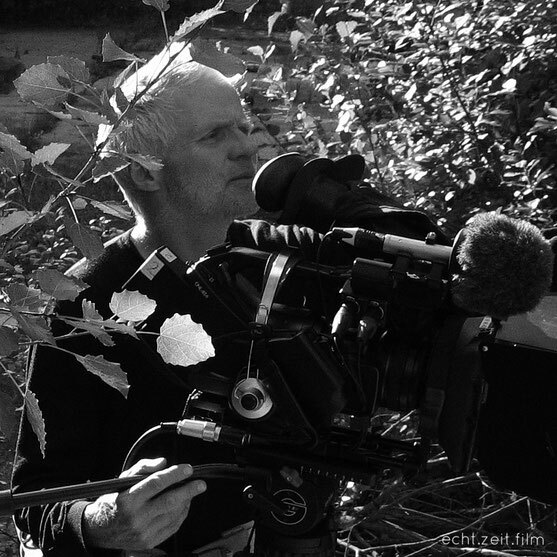 I moved from celluloid to digital after taking an eight-year break from filmmaking, between 1995 and 2003, at the encouragement of my friend Hubert Sauper, who urged me to try a new beginning. Through digital I have found the possibility to work more economically, more independently, and with greater precision, such that there will be no step back to analog. After thirty years of creation, I am both the same and different. I am still able to inhabit my films, but I can do this now without having to step in front of the camera. The endeavors for self-authorization now concentrate upon the protagonists in front of the camera, and upon the film’s viewers. Even more radically than they used to, my films search for closeness, for stepping out of the observer’s role, for opening forward. My work lies in creating these spaces that can be entered by others. Creation is possible to the extent to which I have mentally freed myself. To know and plan my work’s outcome in advance would take all the sense out of it. The work on Fata Morgana unfolded over nearly three years, and even the difficulties that arose internally during its creation helped will it into being. The origin of the film concerns two concrete scenes. At the beginning everything was possible. The film absolutely could have taken place on Lampedusa or in the “Dead Mountains” of lower Austria. Quite early, and among the rest of the events, there was Awad’s invitation to travel with him to the Sahara. Then the war and revolution in Libya made this journey impossible. The Sahara settings used in the film come from a ten-day field trip with test images shot in May 2010. The main shoot was planned for 2011. However, one month before this journey’s beginning, we needed to cancel everything and find a new location. This new place could not be a substitute for the previously planned place, as we had already formed an emotionally intense relationship with the Libyran Sahara. Moreover, it would have been intolerable to make a film in a neighboring country with the knowledge of our friend Awad and his family in mortal danger, unable to flee. We arrived in Lausitz, a district in East Germany, and after a one-week search my wife Maria and I found suitable places for the project’s continuation. The devastation of natural and cultural spaces as caused by brown coal open-cast mining, leading to immense so-called “empty places” directly in the middle of Europe, seemed to clearly represent our resource- destructive Western lifestyle, which Nature was only slowly making an effort to reclaim. As both a main shooting and residential location we found an abandoned farm situated in one of the quarrying areas with a fate already sealed: There would soon open up an abyss of about one hundred meters deep into which the house, woods, meadows, and fields would simply disappear. All of which might seem bad to us, by the way, but for the native population in that place this has been a part of life for several decades. I don’t think that the question of location has a greater or different meaning in Fata Morgana than it has in my other films, though it might seem to at first sight. Locations are basic conditions for me, as are the particular life moment of filming, the period of time available for it, the weather during that period, and the instantaneous sensitivities of everyone in front of and behind the camera. We all bring psychic luggage with us into the scene. At the start of the shoot for Bellavista (2006), for instance, I often had to wait many hours until Giuliana was ready to work with me. Even though there was instantly a familiarity between us when we met for the first time in her home village of Sappada, it wasn’t easy for her to appear in front of a camera. She had never had the experience before, and I think that it was a great challenge for her. If we then set out, we did not know to which place in the village and their surroundings our way would lead us. Very often these were in-between sites—places of retreat that Giuliana had visited in her childhood, or more often, indefinable empty places between two concrete venues. In order to film, we could take these un-places and start anew with them. Places that have never previously been entered offer many unusual new points of view, all reflected by the presence of the film camera, which legitimizes one’s stay. For me this is always a kind of action-taking specific to cinema, which pushes us away from everyday life in order to set us up in an absolutely new situation that stimulates us and challenges our creativity. Here, at these unknown places in between those of the everyday, and with a sufficient credit of time, the necessary devices at hand, alert senses, and enough serenity, the abstraction process of making cinema can begin. I have discovered in my experience and understanding that the truly cinematic locations nearly always show the basic character of what appears to be an empty space, a sort of un-place or wild site. Such are the places that can be made habitable by cinema. I believe that this has something to do with cinema’s talent for abstraction. It is through filming that everyday places receive a sort of wild character and become clearances as cinema releases them from a number of things: From contexts, from meanings, from history, at last from what we are used to calling “reality,” and give them a fictive character through which they can handle all these things better. The cinematic glance is momentary in the full sense of that word. The impartial glimpse of the camera generates a sort of new reality that is only very loosely connected to the reality of the film shoot. A sort of emptying- out takes place: The technical circumstances of camera and microphone effectively and selectively register an effigy of the phenomenon of reality. When we watch a film, this effigy works on our feelings and on our powers of reflection. I think that this process is the heart of cinema. The question of the specifically visible physical location is therefore, for me, a question of circumstantial, subordinated meaning. The states of consciousness, feelings, and associations that a place can generate in a person are vital, and they can hardly be planned or foreseen. Although I always write a long concept at the beginning of a film, as a sort of starting point, the dialogue is not included, and the film’s ideas change greatly during its shoot. We shoot for over an hour at a time without taking a break, and this allows the actors to go deep into the situation and generate the words themselves. What you might call “story” is the result of a long process (years-long, in the case of Fata Morgana) of intensely following a trance state through staying and working at different locations. To know with whom one is jointly traveling, and know him or her well, is essential to doing this. For example, I knew Antonio Cotroneo, the lead actor of my film Toto (2009), for a quarter-century before we filmed together. Over the course of two years we traveled many times to his birthplace in southern Italy, where he showed me unique places and people. However, it was not until after the first year that we arrived at the film scenes. This process was, for both of us, a trip into the depths of our emotions, fears, and longings, getting closer to concrete places in order to become impartially involved with them. Antonio had not entered some since his early childhood, while others he had only passed by before then. Some places counted as his secrets, almost as though they were concealed within him. Under the protection of the camera we could visit them together, as questioners, not as knowers, and open to whatever would happen. Similarly, over the passage of time in my work with Giuliana, I have noticed her taking more and more pleasure in our trials. One day while we were making Bellavista I saw that she had finally left her passive situation of simply being filmed and become, step by step, really an active protagonist. In Fata Morgana she is even more so. It has thus been a great, evolving experience for the two of us in our collaboration, which includes a third film that we are finishing next year. I could not work in this way with people to whom I did not feel great nearness and attachment. This is quite an important requirement for me in films. If the apparatus not used in an attempt to create an objectivizing authority system, but rather brought into the greatest possible closeness (including psychically), then it can help us to track down forgotten and concealed information within our own depths. It allows us to share our secrets without disclosing them. These exchanges can form a dangerous balancing act. When we were shooting Fata Morgana we often met deserts more intense in farm rooms and in our own reactions than anywhere along the Sahara’s sands. It was life itself that led us into the desert, and we had to rely upon one another as we explored it together. I find allowing for life, and for its unpredictability, to be essential to the process of filmmaking: It allows one to be led to true people, to true situations and locations. Making films for me mainly means being led into unknown places. I am never embarrassed by my ignorance, nor am I by my discoveries. Cinema is able to emphasize the strange for me in every place, to clarify my gaze and open it onto a new world. I make films first of all for myself, while still believing that people are very similar at heart. Of course, the search for kindred spirits seldom actually succeeds, but I still think that it is important to always keep in mind this utopia. Thanks to Christoph Huber for research help. Aaron Cutler worked as a programming aide for the Sao Paulo International Film Festival and keeps a film criticism site, The Moviegoer. Wie kam es zu FATA MORGANA? Seit ich Filme mache, erlebe ich immer wieder, dass Projekte wie von selbst aus dem Leben heraus 'wachsen'. FATA MORGANA ist aus vielen 'Zufällen' des Lebens entstanden, könnte man sagen. Zum Beispiel hatte ich nie die Absicht, in die Wüste zu reisen, oder gar, dort einen Film zu drehen... wäre da nicht die Einladung meines Libyschen Freundes Awad gewesen, meiner Familie und mir, 'seine' Wüste zu zeigen, den Ort seiner Sehnsucht, denn auch er lebt als Großstädter in Tripolis. Vielleicht auch stand am Anfang die Reiseerzählung von Giuliana, die vor etlichen Jahren einmal - auf der Flucht vor der Enge in ihrem Dorf - auf die Insel Lampedusa geraten war, ausgerechnet auf jene Insel, an deren Ufern schon viele Flüchtende gestrandet sind... Ein gewisses Gefühl von 'Erdungsverlust' stand wohl auch am Beginn, die 'Heimatlosigkeit' meines Freundes Hermann, das Gefühl meines Freundes Christian, die Unbefangenheit seiner Jugend verloren zu haben, meine eigenen Ängste, die eigene Isolation, und nicht zuletzt die - rundum ausgerufene - Krise der Zivilisation. Krisen machen Filme, auch das ist eine alte Erfahrung von mir, und alle meine Filme sind von Krisen geprägt, haben persönliche Krisen bearbeitet, manchmal auch ausgelöst... Klar ist, um zu filmen, muss man in die Krise eintauchen, oder besser, durch sie hindurch tauchen - hin zu 'neuen Ufern'. die Absage eines meiner Darsteller knapp vor Drehbeginn, der Ausbruch der Revolution und des Krieges in Libyen, die Notwendigkeit, an einem neuen Drehort von vorne beginnen zu müssen, bis hin zu den gruppendynamischen Problemen innerhalb unseres Filmteams während der Dreharbeiten, meinen eigenen inneren Kämpfen in der Zeit der Montage und den Schwierigkeiten bei der Veröffentlichung des Films... alles das aber hat diesen Film entstehen lassen, insofern ist er gewachsen aus tatsächlich Erfahrenem und vor (und hinter) der Kamera Gelebtem. Inwiefern unterscheidest du dich als Filmemacher heute von jenem, der du warst, als du begonnen hattest, Filme zu machen? Wenn ich den 'Beginn' dort ansetze, wo ich Anfang der Achtzigerjahre meinen ersten wirklich eigenen Film, GRELLES LICHT, produzierte, dann bedeutete dieser Anfang, dieser Film, gleichzeitig den Abschluss einer meiner intensivsten 'Lebenskrisen', der größtenteils in Passivität und seelischer Isolation zugebrachten Schul- und ersten Studienjahre, die geprägt waren von Ratlosigkeit, Minderwertigkeitsgefühlen, Liebeskummer und einer matten Düsternis, die alles einhüllte. Das ging so weit, dass ich anderen Menschen nicht ins Gesicht schauen konnte und die meiste Zeit nur auf den Boden blickte. Meine filmischen Erfahrungen hatten sich - nach einer ganz kurzen Euphorie zu Beginn des Studiums - bedrohlich verengt zu einem verzweifelten Versteckspiel hinter den technischen Apparaten, nicht frei von hilflosen Machtgelüsten, aber in Wahrheit ausgehungert nach menschlichen Beziehungen, nach einem einfachen 'Gegenüber', dem ich endlich in die Augen sehen könnte. GRELLES LICHT war für mich eine Art 'Not-Programm', ich musste ihn machen, und vor allem: ich musste ihn so machen, wie er letztendlich geworden ist, ohne Abstriche, ohne daran zu denken, wie er auf Andere wirken würde. Er war meine 'Selbst-Ermächtigung', könnte man sagen, das deutet ja auch der Titel an. In der Rückschau erscheint das - ohne Zweifel - als ein äußerst 'selbsttherapeutischer' Ansatz. Für mich war es jedoch die einzige Möglichkeit, meine übergroße Sehnsucht, mich auszudrücken, zu verwirklichen, mit Anderen 'Leben' zu teilen. Gelingen konnte das nur - ich spürte es instinktiv - durch eine starke formale Reduktion, ein einfaches, überschaubares Vorgehen und ein Bleiben beim Naheliegendsten, in psychischer und in physischer Hinsicht. Ja, wir fuhren zwar hunderte Kilometer im Auto meines Vaters über die Autobahn von Wien zur 'Dokumenta' nach Kassel, dort angekommen, war es aber gar nicht notwendig, die Ausstellung zu besuchen, und wir blieben draußen auf der Wiese sitzen. Frage ich mich jetzt nach den Unterschieden zu heute, würde ich so etwas zumindest heute mit größter Wahrscheinlichkeit genau so wieder machen. Abstraktion ist die Stärke des Films, nicht 'Naturalismus'. Ich musste mich befreien von dem ganzen technischen Beiwerk, ich musste meinen Platz hinter der Kamera verlassen und die Szene betreten, um so endlich in ein erstes Werk 'eintreten' zu können, eines, das zu mir passt und in dem ich mich wohl fühlte. Ich musste das damals noch 'leiblich' tun, was eine ziemliche Überwindung kostete, beim Drehen, beim Bearbeiten des Materials, und erst bei den Vorführungen! Nach dreißig Jahren bin ich so weit, meine Filme 'bewohnen' zu können, ohne selbst vor die Kamera treten zu müssen und insofern konzentriert sich das Bemühen um 'Selbst-Ermächtigung' auf die Darsteller vor der Kamera, letztlich auf die Betrachter des Films. Was aber noch immer aktuell ist, heute radikaler als damals, ist die Suche nach Nähe, das Heraustreten aus der Rolle des Beobachters, die Offenheit 'nach vorne'. Es geht also heute ganz stark darum, Freiräume zu schaffen, in die Andere eintreten zu können. Ich schaffe das natürlich jeweils nur in dem Maß, wie 'frei' ich selbst innerlich bin. Im Voraus zu wissen, wie es ausgeht, würde meiner Arbeit ohnehin jeden Sinn nehmen. Warum und wie hast du den Schauplatz für FATA MORGANA ausgewählt? im Vergleich zu deinen anderen Filmen? Tatsächlich handelt es sich ja um zwei konkrete Schauplätze. Am Beginn war alles offen, es hätte durchaus auch die italienische Insel Lampedusa werden können oder das Tote Gebirge in Niederösterreich. Ziemlich früh gab es, unter anderem - wie bereits erwähnt - die Einladung Awads, mit ihm in die Sahara zu reisen. Die Revolution und der Krieg in Libyen haben das dann unmöglich gemacht. Die im Film verwendeten Einstellungen aus der Sahara stammen ja von einer zehntägigen Recherche-Reise und 'Probeaufnahmen' im Mai 2010. Die eigentliche Drehzeit war dann für 2011 geplant. Einen Monat vor Reiseantritt mussten wir aber alles absagen und es galt, einen neuen Drehort zu finden. Dieser neue Ort durfte kein 'Ersatz' für den geplanten Ort sein, denn wir hatten ja bereits einen - auch emotional -sehr starken Bezug zu den Gegenden der Libyschen Sahara gewonnen - außerdem wäre es unerträglich gewesen, etwa in einem Nachbarland Libyens zu drehen, im Bewusstsein, dass unser Freund Awad im umkämpften Tripolis sitzt, seine Familie sich in Lebensgefahr befindet und von dort nicht fliehen kann. So schlimm das alles ist, für die dort lebende Bevölkerung sind diese Dinge Alltag, seit vielen Jahrzehnten übrigens. Ich denke nicht, dass die Frage des Schauplatzes in FATA MORGANA eine größere oder andere Bedeutung hat, als in meinen anderen Filmen, wenn das vielleicht auf den ersten Blick auch so aussehen mag. Schauplätze zählen für mich zu den 'Rahmenbedingungen', wie etwa auch der Zeitpunkt, der zur Verfügung stehende Zeitraum, das Wetter, und - nicht zuletzt - die augenblickliche Befindlichkeit jedes Einzelnen vor und hinter der Kamera, aber auch das psychische 'Gepäck', das jeder von uns in die 'Szene' mitbringt. Ich habe außerdem die Erfahrung gemacht, dass - in meinem Verständnis - wirklich 'filmische' Schauplätze beinahe immer den Grundcharakter eines 'Leerraumes' aufweisen, so etwas wie 'Un-orte' oder Wüstenplätze sind, und dass es solche Orte sind, die eben gerade durch das Kino betretbar, bewohnbar gemacht werden können. Das liegt unter anderem an der Abstraktionsfähigkeit des Kinos an sich. Vielleicht könnte man sagen, dass durch das Kino auch ganz 'alltägliche' Plätze (aber welcher Platz ist schon 'alltäglich'?) eine Art 'Wüstencharakter' erhalten, zu 'Leerstellen', zu Freiräumen werden, weil das Kino sie befreien kann von Kontexten, von Bedeutungen, von Vergangenheit, letztlich von dem, das wir 'Realität' zu nennen gewohnt sind, nur um besser damit umgehen zu können, das aber nichtsdestoweniger oftmals 'fiktiven' Charakter hat. Der wesenhaft 'filmische', der unbefangene 'Blick' generiert eine Art neuer 'Realität', die mit der 'realen' Situation während des Drehens nur sehr lose zusammenhängt. Es findet eine Art 'Entleerung' statt: die technischen Gegebenheiten von Kamera und Mikrofon zeichnen äußerst selektiv ein abstraktes Abbild der Phänomene der 'Wirklichkeit' auf, und erst dieses 'Abbild' wirkt im Kino auf unsere Gefühle, auf unser Denken. Ich halte das für das 'Herz' des Kinos. Die Frage des konkret sichtbaren 'realen' Schauplatzes ist insofern für mich von untergeordneter Bedeutung. Auch bei FATA MORGANA begegneten wir der 'Wüste' oft weit intensiver in den Räumen des Lausitzer Bauernhofes oder in unseren eigenen Reaktionen. Entscheidend ist das Bewusstsein, die Gefühle und Assoziationen, die ein Ort in den Menschen erzeugen kann, und diese Dinge sind kaum absehbar und lassen sich - glücklicherweise - nur schwer planen. Es war eben auch keine 'Idee', die uns in die Wüste geführt hat, sondern - obwohl es vielleicht pathetisch klingt - 'das Leben selbst'. Und auch das ist im Entstehungsprozess eines Filmes von entscheidender Bedeutung: sich an die 'richtigen' Schauplätze, zu den 'richtigen' Personen und Situationen führen zu lassen. Filme machen bedeutet für mich größtenteils: sich führen lassen, an unbekannte, nie betretene 'Orte' (im weitesten Sinne verstanden, psychisch und physisch). Das Kino kann an jedem beliebigen Ort das Unbekannte hervorkehren, den Blick klären, wie ein Kopfstand sein, eine neue Welt eröffnen. Wie führen dich deine Darsteller an diese unbekannten Plätze? Wie reist du mit ihnen ins Unbekannte, und woran erkennst du, dass du gerade mit ihnen reisen willst? Hermann, der Hauptdarsteller in GRELLES LICHT (1982), und ich wohnten eine Zeit lang zusammen und wir hatten vereinbart, gemeinsam einen Teil für diesen Film zu drehen, er vor der Kamera, und ich dahinter. Als es dann so weit war, dass wir mit dem Drehen beginnen konnten, sagte er mir, dass er jetzt unbedingt nach Kassel reisen müsse, um dort die 'Dokumenta' zu besuchen (Kassel liegt einige hundert Kilometer von Wien entfernt). Meine Antwort darauf lautete: "ok, dann fahre ich mit dir nach Kassel". Und so machten wir es auch. In Kassel angekommen, war für Hermann dann bereits der Film wichtiger geworden als der Besuch der Kunstausstellung. Bei den Dreharbeiten zu BELLAVISTA (2004-05) wartete ich anfangs oft viele Stunden, bis Giuliana bereit war, mit mir zu filmen. Wenn wir dann loszogen, wussten wir meist noch gar nicht, an welchen Platz im Dorf und in der Umgebung uns der Weg führen würde. Sehr oft waren es Plätze 'dazwischen', einerseits 'Rückzugsorte', die Giuliana bereits in ihrer Kindheit aufgesucht hatte, andererseits öfter undefinierbare 'leere' Plätze zwischen zwei konkreten Orten, an denen sie selbst sich noch nie länger aufgehalten hatte. Jetzt, um zu filmen, konnten wir diese 'Un-Orte' in Besitz nehmen und neu definieren. Nie betretene Orte werden so zu Standpunkten, die eine völlig ungewohnte, neue Perspektive bieten, verstärkt und reflektiert nochmals durch die gleichzeitige 'Anwesenheit' der Filmkamera, die den Aufenthalt an jenen Orten gleichsam 'legitimiert'. Ich habe das immer als eine ganz film-spezifische Art von 'Aktionismus' gehalten, die uns aus dem 'Alltag' hinauskatapultiert und in eine völlig neue Situation hineinstellt, die unsere Kreativität anregt und auch herausfordert. Hier, an diesen Orten zwischen den 'alltäglichen' Plätzen, mit einem ausreichenden Guthaben an Zeit, mit dem nötigen Gerät in Bereitschaft, vor allem aber mit wachen Sinnen und einer Portion Gelassenheit - beginnt der Abstraktionsvorgang 'Kino'. Antonio, den Hauptdarsteller von TOTO (2007-09) kannte ich bereits seit 25 Jahren, als wir zu filmen begannen. in einem Zeitraum von mehr als zwei Jahren reisten wir viele Male in seinen süditalienischen Geburtsort und Antonio führte mich an die unterschiedlichsten Plätze dort und zu den unterschiedlichsten Menschen. Es dauerte aber länger als ein Jahr, bis wir an den eigentlichen Filmschauplätzen angelangt waren. Dieser Prozess war für uns beide auch so etwas wie eine Reise in die Tiefe unserer Emotionen, unserer Ängste und Sehnsüchte, immer verbunden mit dem näheren Kennenlernen von ganz konkreten Orten, an denen es galt, sich auf sie - möglichst unvoreingenommen - einzulassen. Manche Orte hatte Antonio seit seiner frühen Kindheit nicht mehr betreten, an anderen Plätzen war er bisher immer nur vorbeigegangen, mit den Gedanken an ein anderes Ziel im Kopf. Einige wenige Orte zählen zu seinen am meisten gehüteten Geheimnissen, fast ein wenig so, als wären sie verborgene Orte tief in seinem eigenen Inneren. 'Unter dem Schutz' der Kamera - könnte man sagen - konnten wir diese Orte gemeinsam aufsuchen, als Fragende, nicht als Wissende, offen für das, was mit uns an diesen Orten geschehen würde. Ich könnte aber auf diese Art nicht mit Menschen arbeiten, zu denen ich nicht - zumindest in einigen wichtigen Bereichen - eine große Nähe und Verbundenheit verspürte. Das ist eine ganz wichtige Voraussetzung. Wenn die Kino-Apparatur nicht als 'objektivierendes' Machtsystem verwendet wird, sondern - in eine größtmögliche, vor allem psychische Nähe gebracht - uns als Such-Instrument dient, um längst in unserer eigenen Tiefe vergessene und verborgene Empfindungen aufzuspüren, dann lässt sie Anteil nehmen am Geheimnis, ohne es preiszugeben. Das ist aber manchmal natürlich auch eine gefährliche 'Gratwanderung' und kann zeitweise - ungewollt - zu einem 'Prüfstein' dafür werden, was eine Beziehung aushalten kann. Was denkst du über Roberto Rossellini's Film VIAGGIO IN ITALIA? Gibt es Filme oder andere Werke, die dich bezüglich FATA MORGANA inspiriert haben? Gibt es andere Filme oder Werke, die dich generell inspirieren? LA NOTTE, und besonders L'ECLISSE sind für mich die wesentlich bedeutenderen Wendepunkte für das Kino als eigenständige, vom Theater und der Literatur losgelöste Kunstform. Natürlich war Rossellini möglicherweise einer der Ersten, die dieses Terrain betreten hatten, aber da habe ich viel zu wenig Ahnung von Filmgeschichte, um das beurteilen zu können. Das Revolutionäre an VIAGGIO IN ITALIA war sicher, dass es kaum eine 'Story' gibt, es auch gar nicht darum geht, eine solche zu erzählen, als vielmehr eine Stimmung, eine Beziehung, ein Gefühl zu vertiefen, auszuloten, dies mit durchaus 'filmischen' Mitteln, wie in der eindrucksvollen Sequenz mit den römischen Plastiken etwa. Rossellini tut dies allerdings, sowohl was die Bildgestaltung, die Darsteller- und Kamera-Bewegungen, als auch die Dialoge bertrifft, in einer sehr konventionellen, oft allzu schematischen, manchmal sogar klischeehaften Art und Weise. Ich finde, dass dem Film, bei allen Stärken, doch etwas Naives, allzu Schwarz-weiß-malerisches und auch Anbiederndes anhaftet, und das nicht nur wegen des (möglicherweise vom Produzenten erzwungenen) 'Happy-Ends'. Es ist hier genau diese, von mir schon angesprochene, filmische Herausforderung, die 'Idee' im Zaum halten zu müssen, um die 'Realität' sprechen zu lassen, nicht eingelöst worden. Aber solche Einschätzungen hängen ja sehr oft mit unbewussten, sehr tiefen, manchmal weit in der frühen Kindheit zurückliegenden psychischen und physischen Erfahrungen zusammen. Als Rossellini drehte, war ich ja noch gar nicht geboren. Die erwähnten drei Antonionis sind aber bereits zu meinen Lebzeiten entstanden, und allein die 'Sets', die ja bei Antonioni sehr stark 'in der Zeit' angesiedelt sind, lösen in mir schon andere, biografisch nähere, intensivere Empfindungen aus, obwohl ich damals noch ein kleines Kind war. Ich denke, dass man solche geistige 'Strömungen' zwischen 'Zeitgenossen', gleichgültig, wie wenig die Einzelnen miteinander auch zu tun haben, nicht unterschätzen soll. Und die Keime für bestimmte Anschauungen und Wahrnehmungsweisen werden zweifellos in den frühen Kinderjahren gelegt. Natürlich habe ich damals diese Filme nicht gesehen, und auch kaum wohl jemand in meiner Umgebung, aber das ist zweitrangig. Überhaupt fällt es mir schwer, zu konkretisieren, wodurch 'Inspiration' stattfindet. denn normalerweise denkt man sich doch 'Inspiration' in Zusammenhang mit der Vorstellung von einem Film, mit der 'Idee'. Diese Ideen gibt es zwar, aber ich empfinde sie als bedrängend, ja oft als bedrohlich, in Bezug auf die Realisierung eines Films. Ich sehe mir in der Regel auch nur sehr wenige Filme an, und zumeist immer wieder die selben zu wiederholten Malen. Und darüber hinaus liebe ich es, mir Filme anzusehen, die mit der Art und Weise meiner eigenen Filme sehr wenig bis gar nichts zu tun haben, die sozusagen für mich, als Person, als Filmemacher, psychisch, physisch und faktisch ohnehin unerreichbar sind. Das ist sehr angenehm, weil es dann durch das Kennenlernen dieser Werke keine praktischen Bezüge zu meiner Arbeit gibt, jedoch viel von tatsächlicher geistiger 'Anregung', noch öfter auch ein sehr erhellendes 'Wiedererkennen' meiner eigenen Verfasstheiten in ganz anderen Ausdrucksformen. Einzig interessant sind für mich Filmwerke, deren Autoren von sich selbst erzählen, bewusst oder unbewusst, das macht keinen Unterschied. So haben mich die Filme von Rainer Werner Fassbinder schon sehr früh angezogen, ihrer Direktheit, Einfachheit und (wenn auch manchmal geradezu brutalen) Offenheit wegen, und weil die meisten seiner Filme wie verzweifelte Schreie eines gesellschaftlichen Außenseiters sind, der es schafft, sein persönliches Leiden in seinen Werken so stark zu abstrahieren, dass es wiederum real, greifbar, als das Leiden einer ganzen Generation, einer ganzen Gesellschaft, vor uns steht. Pasolini stand auch schon früh auf meiner Lieblings-Liste, bereits zu einer Zeit, da ich noch gar nicht wirklich über seine Filme reflektiert hatte. Aber sie hatten etwas Magisches an sich, so erlebte ich es von Anfang an, doch mit Klarheit im Blick, und vor allem mit etwas, das mit Menschenliebe zu tun hat, mit Hoffnung, mit Lebensfreude. Es war auch die Verbindung von Sozialismus und Spiritualität in seinen Werken, die mich besonders angesprochen hat, und noch immer anspricht. auch meine kleinen, ganz anders gearteten Dinge weiter zu betreiben. In jüngster Zeit erst habe ich - sehr verspätet, weil er ist ja mein Geburts-Jahrgang - Aki Kaurismäki für mich entdeckt. Er ist ein wunderbar Demütiger, voll echtem 'Humor', der mit der größtmöglichen Einfachheit und Klarheit 'Erzählkino' schafft, und doch 'nur' die Wirklichkeit vor der Kamera erzählen lässt, ohne Zutaten. Er verschafft mir als Betrachter die tiefe Freude, seinen Darstellern dabei zusehen zu dürfen, wie sie gerade eben jetzt 'sie selbst' werden - vor der laufenden Filmkamera. Gemeinsam ist diesen so unterschiedlichen Autoren vielleicht eines, ein ganz Wichtiges: eine Liebe und eine große Nähe zu ihren Darstellern, zu allem, was sich vor ihren Kameras befindet, bei Bergman so stark, dass man den Eindruck gewinnt, seine Figuren seien nur Aspekte seines eigenen seelischen Innenlebens, Teile seiner selbst. Einen Schriftsteller möchte ich noch erwähnen, dessen Werke mich seit dreißig Jahren ständig begleiten und inspirieren: Paul Celan. Seine Lyrik ist immer neu zugegen, gegenwärtig, nie fertig, nie zu fassen, nie 'verstanden', die Worte seiner Gedichte sind sie selbst, autark, stark, unvernichtbar, ewig. Trost und Utopie ohne jede Sentimentalität. was ist für dich 'Kino'? Kino hebt die Zeit auf (das glaube ich zu wissen)....aber was bleibt? Vielleicht bleibt nur: die Gegenwart....Einzelbild für Einzelbild, immer neu? Gegenseitiges Vertraut-werden mit dem Leben aller Mitwirkenden, mit dem Text, mit den wenigen technischen Hilfsmitteln. Die Idee des Textes in den Raum stellen, um sie leichter vergessen zu können. Die Idee des Textes ist auch die Idee von der Arbeit an diesem Text, an diesem Film, an diesem Zusammensein. Darüber hinaus ist wenig vorzubereiten. Durch "Probeaufnahmen" werden wir die Eigenschaften der Objektive und des Filmmaterials kennenlernen, doch weniger deshalb, ein "sicheres" Produkt zu erhalten, als BERUHIGT und voll Vertrauen mit der Arbeit beginnen zu können. Wir wollen mit einer minimalen technischen Ausrüstung das Auslangen finden, überschaubar, auf das Wesentliche reduziert. Je weniger wir mit technischen Spezial-Aufgaben beschäftigt sein werden, desto mehr können alle teilhaben an der uns umgebenden Wirklichkeit. Alles, was wir dann tun werden, wird eher unseren Empfindungen gehorchen, als irgendwelchen äußeren Notwendigkeiten. DIE KAMERA IST NICHT DAS ZENTRUM / die Filmkamera ist EIN Bestandteil dieser Arbeit, sie wird von EINER Person geführt, steht in gleicher Weise NEBEN den übrigen Mitwirkenden. Sie soll weder "unmerklich" im Hintergrund verweilen, um dann aus sicherer Position die Darsteller zu belauschen, noch soll sie im Zentrum der Aufmerksamkeit stehen und all unser Bemühen herausfordern. Es braucht also nichts "für die Kamera" geschehen, sie ist einfach da, in unserer Mitte, stellt eine Wirklichkeit dar, die nicht wegzuleugnen sein wird. Im Gegenteil: es geht ja darum, ZU FILMEN, und nicht darum, so zu tun, als wäre es "gewöhnliches" Leben. Also ist die Kamera ein Bestandteil, immer bei uns, uns gegenüber. Wir sollen aber auch nicht verlangen, dass die Kamera "für uns" da sei. Sie ist ein Ding, arbeitet ja ohnedies "von alleine". Die Person "hinter" der Kamera jedoch ist in eine Reihe neben uns gestellt, will nahe kommen, sich entfernen, ist Darsteller ganz wie jeder von uns. von ihm genommen sein, damit er ohne Vorbedacht - auch technischen Problemen gegenüber - handeln kann, diese Zeit zusammen mit den anderen Mitwirkenden für sein Leben "nützen" kann. Wir belichten auf Schwarz-weiß-Filmmaterial. Wir verwenden ein Objektiv mit feststehender Brennweite, welches ein Bild erzeugt, ähnlich dem vom menschlichen Auge erzeugten. Wir verzichten auf komplizierte Kamerabewegungen. Wir haben den Apparat in einer Position befestigt - oder aber, aus einem spontanen Empfinden heraus, wird die Kamera von Hand aus geführt, um näher zu sein, um die EIGENE (innere) Bewegung ins Bild zu bringen. In diesem Fall wird dann alles BLICK sein. Es gibt also den eher "apparativen" Ausschnitt, bei dem die Kamera gleichsam "allein gelassen" wird - und jenen menschlich bewegten Blick, die GANZE Anteilnahme und den ATEM einer Person wiedergebend. Beide Arten von "Einstellungen" sind jedoch unterworfen der einen großen Herausforderung: Nähe und Zuneigung. Im ersten Fall hat die mit der Kamera befasste Person die Möglichkeit, den Darstellern direkt gegenüberzutreten, ohne den Apparat dazwischen, denn es braucht nicht unbedingt "durch die Kamera gesehen" zu werden. Im zweiten Fall kann sie MIT DER KAMERA GANZ NAHE, neben den Darstellern sein. DER SPONTANE BILDAUFBAU / die Empfindung des Augenblicks zählt. Das Film-Bild ist ein Ausschnitt aus Raum und Zeit - einen wesentlichen Teil dieser Aufgabe bewältigt der Apparat ohne viel Zutun. Der Darsteller hinter der Kamera kann diese Qualität intuitiv nützen zur Umsetzung seiner eigensten inneren Beziehung zur Wirklichkeit, welche die Kamera abbildet. Das heißt: er/sie bestimmt den Ausschnitt aus SEINER/IHRER inneren Bewegtheit heraus, oder: er/sie ermöglicht es, dass Empfindungen zur Darstellung gelangen. Eine der Grundvoraussetzungen dafür ist die Gleichgestelltheit von Darsteller und Kamera. Beide befinden sich in Raum und Zeit, sind Teilnehmer an einem "Spiel". Nur in dieser Unbefangenheit kann eine Atmosphäre des Wohlbefindens entstehen, die es vermag, alle Mitwirkenden anzuregen und in ähnlicher Weise betroffen zu machen. Und dann werden Vertrauen und Zuneigung möglich. Zuneigung zur Wirklichkeit, das ist Versenkung in den Augenblick. Vertrauen auf den einfachen Blick, das ist Staunen über die Welt, Über sich selbst. Und da braucht nichts zentriert, nichts komponiert werden. Geräusche können einen leeren Raum auffüllen. Der Schatten einer Bewegung kann das Bild des bewegten Körperteils selbst ersetzen. Der Klang der Stimme benötigt nicht unbedingt das Bild eines sprechenden Mundes. Ein heller Lichtschein kann an die Stelle eines gesprochenen Satzes treten. Von selbst gelangt der Apparat in die "Augenhöhe" der Menschen, und auch hinunter, neben die kleinsten Dinge, die allesamt unseren liebevollen Blick herausfordern. Das Detail - nicht der distanzierte Überblick. Einfach "hinschauen" und vertrauen, nicht nacheilen, nichts "einfangen" wollen, nicht "korrigieren", aus der Rolle des Beobachters heraustreten. HORCHEN AUF DIE BILDER, nicht versuchen, in den Bildern etwas zu "sagen" - vieles kommt von selbst zur Darstellung. Oft ist z.B. ein Geräusch von größerer Bedeutung, um die Wirklichkeit erfahrbar zu machen, als etwa ein veränderter Aufnahmewinkel der Kamera. Beobachten bedeutet meist Distanz. Wir aber sollen immer die Nähe suchen, auf den Menschen horchen, mit ganzem Interesse und mit der größtmöglichen Zuneigung den DIALOG anstreben. Wir stehen also der Wirklichkeit gegenüber, mit unserem wachen Empfinden, mit unserem Bedürfnis, selbst dieser Wirklichkeit ganz anzugehören, der Angesprochene zu sein, und das Du im anderen Menschen, in den Dingen, Räumen, Landschaften - anzusprechen. Die "Macht" des Filmapparats ist eine ganz und gar gedachte. Lassen wir uns von unseren Empfindungen leiten, müssen wir erkennen, dass der Filmapparat ein bloßes Ding ist. Wird dieses Ding liebevoll geführt, so hat es nun allen Schrecken und alle Gewalt, die wir ihm andenken können, gänzlich verloren. Es dient uns als Spielzeug des Forschens und Erkennens unserer eigenen Existenz. Vorausgesetzt, dass der Umgang in einer dialogischen Weise stattfindet. Wir werden zögernd und scheu beginnen, nicht angreifend oder herausfordernd. Die Erfahrungen sollen langsam, behutsam, Schritt für Schritt gemacht werden. Unser Bestreben wird die Nähe sein, nicht gleichbedeutend mit einer "Nahaufnahme". Und die "Distanzen" werden sich von Mal zu Mal verändern, je nach dem beiderseitigen Empfinden. Der Raum soll nicht eingeengt sein. Ein "Fenster", eine "Tür" soll stets offen stehen - der Ausschnitt auf der Mattscheibe darf die Wirklichkeit nicht "fixieren". Das hieße, die Empfindungen ABTÖTEN, zumindest verdrängen. Vergessen wir den beobachtenden Blick auf die Mattscheibe - versuchen wir lieber, ruhig das Laufgeräusch der Kamera wahrzunehmen. Und seien wir wach für das Befinden des Einzelnen. Übersehen wir niemals das Leiden unseres Gegenübers, Überhören wir nicht die unbedeutendste, nicht-gestellte Frage. Die Wirklichkeit unseres Zusammenseins soll in jedem Augenblick von uns verantwortet werden. Es gibt nichts zu verbergen. leere Form einen Schatten werfen auf UNSERE Bilder, auf unsere gemeinsame Arbeit. Wenn wir schweigen, beginnt die Stille zu sprechen. sind die sichtbaren Bewegungen, welche die Filmkamera aufzeichnen kann. Die Darsteller vor der Kamera werden ihre Empfindungen durch den Klang ihrer Stimmen und den Rhythmus ihrer Körperbewegungen einander und uns vermitteln. Es ist eine beruhigende Tatsache, dass das "Auge" der Filmkamera eben nur jene äußeren Bewegungsabläufe "aufzeichnen" kann, als greifbare, direkt wahrnehmbare Zeichen einer sonst verborgenen Innenwelt. Das Wesen des Films (des Filmapparates) ist ja die BEWEGUNG IN DER ZEIT, das heisst: die sichtbaren Bewegungen der Wirklichkeit gelangen, von der rotierenden Bewegung der Sektorenblende unterbrochen, auf den an der Bildbühne vorbei bewegten Filmstreifen. Wir wollen versuchen, Vertrauen zu bekommen in diese einzigartige Qualität, indem wir die äußeren Bewegungen der Filmkamera im Raum so sparsam, so behutsam wie nur möglich einsetzen. Es wird nicht sinnvoll sein, den Bewegungen der Darsteller mit der Kamera etwa zu "folgen", wenn dies nicht aus einer starken Empfindung der Person hinter der Kamera geschieht. Die äußeren Bewegungsabläufe vergehen rasch - die inneren Bewegungen finden ihr Nachbild in der "Beharrlichkeit" des apparativen Kamerablicks , der die Oberfläche der Dinge durchscheinend werden lässt, in uns, im Betrachter. Alleingelassen, werden Bewegungen im Raum stärker erfahrbar als Veräußerung innerer Abläufe. Dazu kommt, dass die Arbeit an den Kamerabewegungen uns fortführt aus dem Jetzt, und unsere Hinwendung vergeht, der Apparat rückt zwischen uns und die Wirklichkeit, der Dialog gerät ins Stocken. Den INNEREN BEWEGUNGEN soll unsere ganze Aufmerksamkeit gelten. schlags in der Bewegung einer Hand, glatte Haut und rauer Stoff, das Blinzeln eines Augenlids in der Sonne - doch nichts davon ist vorstellbar jetzt, alles wird vielleicht anders kommen. Im Augenblick, da die Kamera läuft, wird es uns umso deutlicher werden, dass jede Vorstellung, jeder Gedanke seine Bedeutung verloren hat. Was zählt, heißt nur mehr: WIR SIND JETZT HIER. Und wir verlieren uns in dieser Wirklichkeit unserer Beziehungen zueinander und zur Welt: GANZ FÜR UNS SELBST. Es gilt, Zeichen und Deutungen nicht zu früh zu setzen, womöglich bereits, bevor wir auf sie gestoßen sind. Wir haben uns auf die Suche begeben, nur ohne Zwang werden wir etwas finden: unsere eigene Geschichte in den Geschichten der Welt, dunkel, bedrohlich, hell, leicht. An einer BERUHIGTEN KAMERA kann das Weltgeschehen wie ein munteres Bächlein vorbeifließen. Die Darsteller haben einen Text neben sich, gleichviel wie sie ihre eigenen Empfindungen IN SICH tragen. Beide Elemente sollen in gleicher Weise ZUM AUSDRUCK kommen, erst einmal hörbar, sichtbar gemacht werden. Wenngleich wir von den Stimmlagen ausgehen, wird das Schweigen einen breiten Raum in unserer Arbeit einnehmen. Der schweigende Darsteller ist DER EINZELNE MENSCH IN DER WELT, steht mehr FÜR SICH da, als der im Dialog sich befindende (obwohl es einen sehr innigen Dialog im Schweigen geben kann). Wenn dieser EINZELNE Mensch dann geöffnet (der Kamera) gegenübersteht, bedarf er der größtmöglichen Offenheit, Nähe, Hinwendung. Das Schweigen zu filmen, zählt also zu den größten Herausforderungen - und ebenso: das Schweigen ZULASSEN, dem Schweigen Raum geben, und wenn es auch ein Schweigen aus Leere zu sein scheint - gerade das Schweigen kann uns wieder zur Erfülltheit zurückführen (wenn wir schweigen, beginnen wir langsam, unseren Herzschlag zu spüren, und eine Empfindung taucht auf: ICH BIN DA!). Schweigen, das aus einer BERUHIGUNG herrührt, kann innigster Ausdruck einer Beziehung sein, tief-erfüllende Trauer oder die Vorahnung des eigenen Todes einschließen. Vielleicht werden wir im Laufe unseres Zusammenseins immer mehr zum Schweigen kommen - dann sollten wir immer mehr dieses Schweigen filmen. Alles bisher Gesagte möchte jedoch eigentlich nur hinweisen auf jenen Blick eines Kindes, der uns "Erwachsenen" bereits verloren gegangen ist. Sicher, oft und oft gibt es ein "Verstehen", ein "Nachfühlen", vielleicht eine leise, ferne Erinnerung, doch gerade zusammen mit Kindern erleben wir: es gibt kein Zurück mehr, es gibt keine Wiederholung. Was bleibt, ist eine zarte Annäherung - über eine tiefe Kluft aus Erfahrung und Schmerz hinweg. Wenn wir imstande sind, den Filmapparat für uns arbeiten zu lassen, werden wir die Erfahrung machen, dass der unbefangene Blick des Kamera-Auges uns in die NÄHE führt, auch in die Nähe unserer eigenen Kindheit. Jene zarte Annäherung, die uns doch manchmal ohne Mühe im Zusammensein mit unseren Kindern geschieht, wird also erfahrbar als etwas, das im Wesen des filmischen Ausdrucks tief verborgen ist (beim Betrachten stummer Filmaufnahmen in einem dunklen Raum habe ich mich oft unwillkürlich an Bilder aus meinen Kindertagen erinnert). Das Auge der Kamera, losgelassen, kann uns einen längst vergessenen Blick offenbaren, kann weit über unser heutiges SEHEN hinaus, einen Blick in unsere eigene Vergangenheit oder Zukunft uns vorstellen, greifbar werden lassen. Doch wir selbst sollen uns keinen Illusionen hingeben: Für uns ist jene Frische des Blicks verloren. Jedoch kann der Filmapparat - gleich wie ein Traum - diesen Blick auf die Welt in unserer Erinnerung wieder wachrufen. Deshalb sollen wir die Filmtechnik LOSLASSEN, damit sie das vorführen kann. Wir sammeln "Material", wie wir das auch sonst tun (ohne zu filmen). Und wir brauchen nicht andauernd zu erwägen, was wir dann "mit diesem Material anfangen" können. Jegliches Auflisten, Bedenken und Reflektieren in dieser Zeit des offenen Empfindens, würde dieses Empfinden und den unmittelbaren Zugang zur Wirklichkeit stören oder verhindern. Zum gesammelten Material zähle ich nicht nur alles, was mit Bild- und Tonmaterial zusammenhängt, wie etwa Körnigkeit, "Vor- und Nachläufe", "Lichteinfälle", "Windblubbern" .. , sondern ebenso alle unsere inneren und äußeren Erfahrungen und Erlebnisse. Wir sammeln, was auf dem Weg liegt, es kann uns nichts verloren gehen, alles, ,was uns angeht, werden wir finden, wenn wir suchen. Wir sollen beim Filmen nicht an die Montage denken. Die Montage ist ein ganz eigener, in der Zukunft verborgener, empfindungsgemäßer Akt - zur Zeit des Filmens un(be)greifbar, unerfahrbar, behindernd, ja destruktiv in ihrer Endgültigkeit. Denken wir also beim Filmen nie an die Montage. Bleiben wir immer ganz "auf dem Boden" der Wirklichkeit: selbst die Montage kann jene unfassbaren Räume, welche letztendlich im Betrachter entstehen können, nur vorbereiten, der eigentliche Akt des Filmens findet in anderen Räumen statt, und in diese wollen wir eintreten.